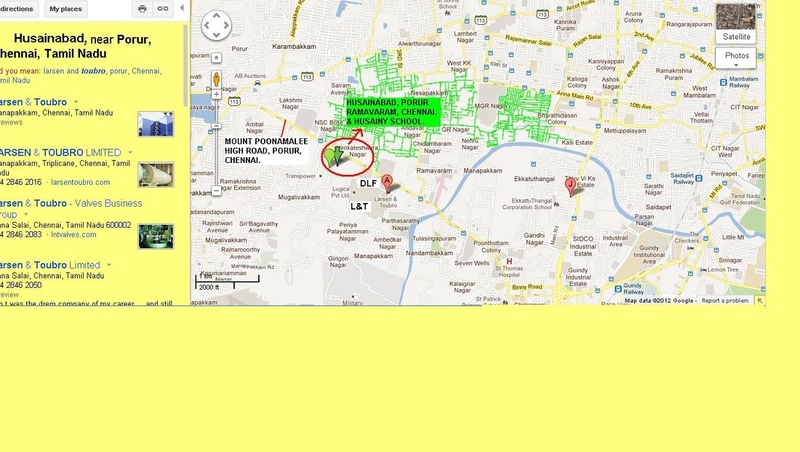 Hussainabad is located at Ramapuram near Porur, Chennai, South India. Hussinabaad consists of Husainy Home for Children and Husainy School. Its office is at Thousand Lights attached to 1000 Lights Masjid. Many children from all over India stay in the Hussainy Home for Children to continue their school and higher studies. There is a Masjid in the midst of the playground. Apart from Religious, Moral, School and College studies Hussainy Trust also trains them in both Indoor and Outdoor Sports Activities. Once in a Year Hussainy Trust conducts a Summer camp which is called as Husainy Camp. It is such a systematic Camp that encourages Children and Youths of our community to participate in it and gain spiritual and worldly benifits. Husainy Trust is a social service organisation which is Registered under the Societies Registration XXXI of Act 1860. Recognized and Aided by the Government of Chennai. This organisation helps the poor, widows, and needy people. It has a vast wakf property donated by the legend of our Shia Community Late Mr. S.V. Mir Ahmed Ali Sahib. His contributions to our community cannot be described in words. S.V. Mir Ahmed Ali Sahib joined clerical service in the Government Mohammedan College Madras and later obtained his Bachelor’s Degree in Oriental languages and also his M.Ed in Psychology. Mir Ahmed Ali Sahib’s English translation with commentary of the Holy Qur’an printed by Tahrike Tarsile Qur’an from New York in 2002, is quite popular, especially with reference to the Holy Bible. He was a contemporary of Mirza Ghulam Abbas Ali Sahib. 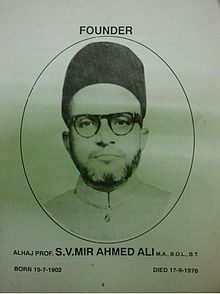 It appears that SV Mir Ahmed Ali Sahib had first published in the year 1925, a booklet of 25 pages under the title ‘The King of Martyrs’ which was reprinted four times by the year 1964. Its popularity prompted him to write a second book ‘Husain - the Savior of Islam’ which was first printed in 1964. Its second edition is printed by Ansariyan Publications, Qum, Iran in the year 2005. This book makes many references to the Bible and Christian dogma in regard to the martyrdom of Imam Hussain (a.s). His translated Quran in English language is famous for its extraordinary commentary (Tafseer) worldwide. S.V Mir Ahmed Ali was an Islamic scholar, religious leader. He was born on July 15, 1902 in Madras, British India. Mir Ahmed Ali was born into a family whose paternal ancestors were decedents from the Fourth Holy Imam Ali ibn al-Husayn Zayn al-'Abidin, called themselves Sajjadis. Originally from Hejaz, they migrated to India through Iran and settled down at Bijapur. His great grand-father Mir Abdul Ali Sajjadi served as a commander in the Moghul Army and earned the distinction with the title Vafakhani for his loyalty to the crown. Thereafter, the members of his family became popular as Sajjadi Vafakhani. Mir Ahmed Ali received preliminary education from his maternal uncle Mr. Mir Jaffer Hussain Peer and later matriculation at Harris High School, Madras. After that he joined the Govt. Mohamadan College in clerical services. During his service he obtained title of Munshi Fazil, B.O.L Degree and qualified himself with M.A in Arabic and Persian. He was then absorbed in the same college as Asst. Professor and later Later on he got B.T and M.Ed. degree from Madras University. The interest in Arabic and Persian made him purse a Diploma in higher proficiency in those languages. It was this time when he founded The Hussainy Trust (Formerly known as Madarasa-e-Hussainy and Yateemkhana) in 1943. Mir Ahmed Ali traveled extensively after getting voluntary retirement from Govt. Mohamadan College. In the mid-fifties in his travels through India and abroad, he devoted his entire life for the upliftment of the orphans and destitute children.The trust expanded and grew bringing in much required funds to serve many and still following-up on the work initiated by him. It continued the hard-work and love towards orphans and the destitute. He served the president of The Hussainy Trust until his death. He was a teacher, a writer, a theologian and educationist. He has written number of booklets on religion. His famous books are 'Hussain the Savior of Mankind', 'King of Martyres', 'Life of Prophet Mohamed'. His most outstanding work an English translation of The Holy Qur'an as explained by Ahlulbait(A.S). He also published journals like 'Peace Maker' and 'Imam'.